In the UK it was Shrove Tuesday yesterday; or pancake day if you prefer. Most people forget pancake day these days. It was always a big deal when I was growing up – but the only pancake you’d ever get was dressed in a squeeze of lemon and some sugar. Maybe I was just deprived but it’s all I knew in the 70’s and early 80s. We already had pancakes this week; Freya and I met up with her brother and his girlfriend in Chelsea for Dutch Pancakes in My Old Dutch. It wasn’t bad although £10 for a pancake with a few pizza toppings is a bit much. That said the beer was reasonably prices and I have a very nice Kriek Boon – which usually costs a lot more. I promised Freya pancakes this week – and hoped to have a few for dinner before going to our regular Rock’n’Roll dancing class – but North Circular traffic put a stop to that. It did allow us a good two hours to think about the pizza toppings. It also allowed an amusing text exchange between a couple of my friends – who eventually admitted defeat to my relentless pancake puns. 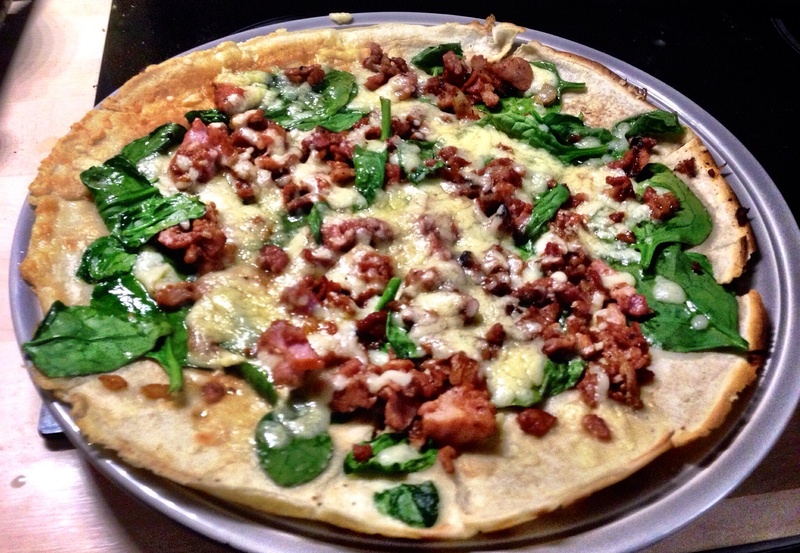 Bacon, Spinach and cheese was the eventual winner – going totally against the ‘no cooking meat on the boat rule’. Rules are made to be broken though. Pancakes are pretty easy to make – it’s only eggs flour and milk. Some people add melted butter to the batter, some add and extra egg yolk, some add oil. I opted for the extra yolk option but only because I had one lying around from a previous recipe. You need your pan to be super hot. I always make my pancakes in a mix of butter and oil – and wait for the butter to brown. I also tend to make savoury pancakes a bit thicker than the sweet variety as the toppings tend to tear the base and it all goes horribly wrong if you need to grill the cheese afterwards. You just can’t shift them out of the pan! Thicker is better in this case. I fried the bacon in a pan first – I used really cheap bacon bits from Morrisons – I think they were only 89p – in keeping with the frugality of pancake day. In hindsight a better quality of bacon might have been better – less salty for a start – although it didn’t bother me. Once you’ve make your pancake, top it with trimmed spinach leaves, your cooked bacon and a generous handful of grated cheese. Pop it under the grill and let the cheese bubble. When it’s ready slide it onto a plate and serve. I made enough batter for two each but one was enough really. It was very filling and very very tasty. I think I might start making pancake pizzas from now on. It uses up eggs and milk and there’s always something you can put on a pizza/pancake. Yes you read it right. Savoury porridge! One of the more curious offerings in Hugh Fearnley Whittingstall’s River Cottage Light and Easy cookbook – this recipe was potentially the dud in the book. I remember making practically everything in one of Ottolenghi’s books once and then tried something with Verjus and it make me think ‘well you can’t always get it right’. This recipe for me could have been that recipe. But it wasn’t – it was very good indeed. Freya looked puzzled – and a little cautious but she liked it too. We ate quite late today having gone to the gym after work – I didn’t start making it till 8:30pm and it is quite time consuming. Fortunately we were watching the film ‘Locke’ – another film I thoroughly recommend you watching. It only has one person in it and he drives a car from Birmingham to London for the duration of the film. Curious!? Give it a go! To make this you top and tail some big onions (leave them in their skins) and roast them on a bed of oil, thyme and sea salt until they caramelise. The you add bay leaves, and garlic, wrap in foil and bake for even longer this time until they are tender. This took about an hour. Take the onions out and keep them warm. Add stock to the herbs and oil and then make a porridge as you usually would – stirring for about 10 minutes, checking the seasoning along the way. While the porridge is cooking, toast some hazelnuts and chop a little parsley. Then you’re done. 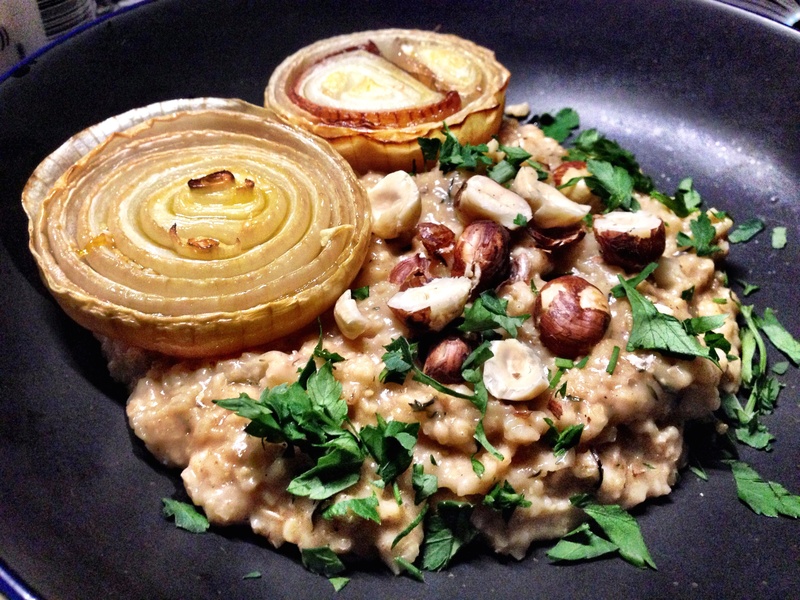 Just serve the porridge with a couple of onion halves, a few crushed hazelnuts and the parsley. It’s very much like a risotto. Quite creamy despite there being no dairy. Much like the ‘actual’ risotto I made the other day it feels like it’s got cream in it but it hasn’t at all. This really was better than I expected and I would probably make it again if I was having someone round just to see them raise their eyebrows in disbelief. If it were just for me I would probably give it a miss as it takes too long to make and I much prefer the oven baked risotto I made the other day. That said. How often do you only have onions and porridge in your cupboards! Pretty sure it could be an emergency meal!